April 3, 2017 (Spring Valley) – A petition to recall three members of the San Miguel Consolidated Fire District board has been axed by Registrar of Voters Michael Vu for failing to comply with formatting requirements. The proponent, Robert Cederdahl, a former member of the board in the 1990s, did not submit amended forms by deadline, so the recall effort is up in smoke before any petitions were circulated for signatures. November 12, 2016 (San Diego’s East County) – In July, San Miguel’s Fire Board voted by a slim one-vote margin to cancel its contract with CAL FIRE a year early and go back to being a free-standing district, but kept the action on hold pending outcome of the election. November 4, 2016 (San Diego’s East County) – The future of the San Miguel Fire District hangs in the balance. Should San Miguel keep its contract with Cal-Fire or return to being a stand-alone district, as the current board recently voted by a slim margin? We interviewed a representative from each of the two slates running for our East County Magazine Radio Show on KNSJ. Listen now by clicking the orange audio link. In this heated session, incumbent Bill Kiel, a retired engineer, makes the case for staying with Cal-Fire, while retired fire chief Kim Raddatz argues for giving Cal-Fire the boot and returning to an independent district. Each side claims their position will be best for taxpayers and public safety. One side is backed by Cal-Fire firefighters, the other by leaders of the former San Miguel firefighters. October 20, 2016 (Crest) – The stakes are high in the San Miguel Fire Board race. In July, the board majority voted to axe a contract that outsourced firefighting to Cal Fire, entered into back when property tax revenues had plummeted in the recession and the district had shut down a fire station. Now four candidates want to undo the recent vote and keep the deal with Cal Fire, while four others are running to restore local control. The ninth candidate says he hasn’t made up his mind. There are four seats up for grabs. All nine appeared at a candidate forum tonight in Crest, a town that burned in the 2003 fires and where residents pay a higher assessment for fire services than any other fire district locally. February 26, 2015 (Spring Valley) – As a result of an East County Magazine (ECM) inquiry, San Miguel Fire District’s Board voted this week to make its finance committee a permanent standing committee, which means that the committee’s meetings will now be open to the press and public. Previously, the finance committee was deemed an ad-hoc committee by the district, which argued that it did not need to allow public access. ECM contacted Californians Aware (CALAWARE), an organization that protects public access under Califoirnia’s sunshine laws. Updated October 22, 2014 - CAL FIRE Chief Tony Meacham, head of the County Fire Authority, has written to dispute statements made by two candidates in this race, which he says are "factually false." You can read details of the Chief's statements here. October 18, 2014 (San Diego)--In 2012, the San Miguel Fire Board voted for CAL FIRE to take over firefighting operations. The board voted unanimously for the five-year contract because the agency was deep in a hole economically and had already closed a fire station. Those in favor argued that this decision would allow the board to continue operations, recover financially, reopen the closed station and keep service at comparable levels. But critics including at least one challenger running for the board have sharply criticized the deal with Cal-Fire, citing loss of local control and potential delays in response times, also faulting other board actions. East County Magazine e-mailed questions to all candidates, including inquiries about the CAL FIRE arrangement and a letter the district received from the State Comptroller raising questions over the board’s finances. The six candidates include two incumbents (Chris Winter and Rick Augustine) seeking reelection and four challengers. Three of the challengers are running together as a slate (Theresa McKenna, Jim Ek, and Mike Vacio). The other challenger is Cindy Croucher. Bios for incumbents Winter and Augustine are available on the San Miguel Fire district website. Three candidates, challengers Theresa McKenna and Jim Ek, along with incumbent Chris Winter, have responded. Below are the questions, and their answers, posted in full in the order received. 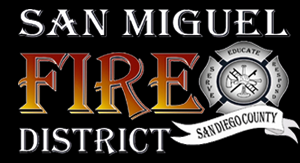 April 5, 2014 (San Miguel) San Miguel Fire Board meets on April 9 at 5:30 in the fire station at 2850 Via Orange Way in Spring Valley. This week the board will consider an ordinance allowing the board to declare waste and certain vegetation a public nuisance – including potentially the majority of native vegetation in the district. November 7, 2012 (san Diego)- In the hotly contested Lakeside Fire District, former Lakeside fire chief Mark Baker captured 39.6% of the vote while fire captain/paramedic/ and board director Jim Bingham clinched 36.6%, beating out challengers. There has been controversy over these two figures, since Bingham voted to fire Baker as Chief, a move that sparked a backlash among community members and questions of influence by firefighting union members on the board. (http://www.eastcountymagazine.org/node/11356). Nonetheless, these two will have to set aside their differences and work together in this district, where some of East County’s largest wildfires have occurred. October 16, 2012 (Spring Valley)- Civil engineer John Revels is running for the San Miguel Fire Board. In an exclusive interview with East County Magazine, he shared his views on his candidacy and the future of the fire district. October 4, 2012 (Spring Valley) - San Miguel fire board recently voted to outsource all fire services to Cal Fire. There are six candidates running for four seats on the board. Other candidates include retiree Randy Dibb, incumbent board members Karrie Johnston Scully, fire captain/paramedic David Rickards, civil engineer John Revels, and college educator/businessman Dan McMillan. View a map of the district: http://www.smgfire.org/district-map. Below is a profile on retired civil engineer William Kiel. October 20, 2011 (San Diego’s East County) – Residents in the Dehesa area of unincorporated El Cajon will be losing a firefighting structure engine and a wildland fire engine due starting November 1. In addition, a three-man engine will be replaced by a two-man paramedic crew—a situation that the San Miguel Firefighters Association (SMFA) contends on its website is “unsafe” but that the District contends is necessary due to dwindling property tax revenues that fund firefighting services.